I’m writing this post at the end of a day that has been spent delving into the archives of the Victoria and Albert Museum. I’m currently studying MA History and Culture of Fashion part time at London College of Fashion, and today’s visits were part of the unit I’m studying this term. If you’re wondering where the Cyberman comes in… I’ll get to him later. This morning, I headed across London to the V&A itself, where we had an appointment to look at some of the items available to view via the Prints & Drawings Study Room. After an overview from our course leader, who had requested specific items from that archive to show us, we were left to look through the various fashion plates, illustrations, drawings and photographs. I was rather taken by a book of vibrant 1940s design sketches from the House of Worth, but my favourite item was a photographic print of a Helmut Newton image of Yves Saint Laurent’s Le Smoking. I spent rather a long time pondering its virtues. In the afternoon we hopped on a Heatherwick-designed Routemaster bus and headed to Blythe House, which is home to the vast archives of the British Museum, the V&A and the Science Museum. Here we were introduced to some fashion-related items in the Archive of Art & Design, including photographs of Lucile designs from the late 19th century, knitting patterns from the 1940s, trend forecasting books from the 60s, and products that were sold at Big Biba in the 70s. (Apparently they used to have an original tin of Biba baked beans until it exploded!) My favourite item here was, once again, a photograph. This one was a John French shot of a model (or mannequin, as they were called then) wearing one of the first strapless bras. The print was covered in pen annotations indicating where the photographer wanted the image retouched… and you could see that retouching on the enclosed negative. On the number 10 bus back to central London, I sat on the top deck with seven of my course mates, discussing our day. There was a definite school trip vibe, and I think we confused a lot of commuters with the subjects of our conversations! Sadly, the only image I snapped throughout the entire day was in the reception area at Blythe House, where part of Eduardo Paolozzi’s Krazy Kat Arkive of Twentieth Century Popular Culture is displayed. 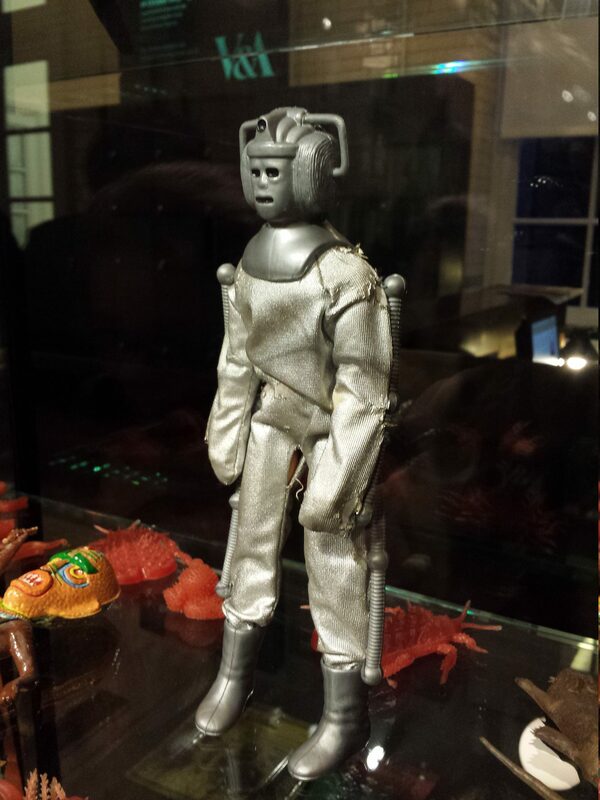 I took the above photo of a Cyberman toy for my Doctor Who loving colleague, Nick. So far, 2014 has brought me much joy. Long may it continue! That sounds like such an interesting day, Thanks for the cyberman! I would like to go to Blythe house one day, it always sounds very interesting.